Graced with European flair, this sprawling one-story house plan invokes nostalgia in a graceful yet modern way. Bay windows accent the guest bedroom, study, garage, screen porch and sitting area. A single column defines the open foyer, dining and great rooms. The kitchen and breakfast area spill into one another and overlook the rear porch. The 436 sq. 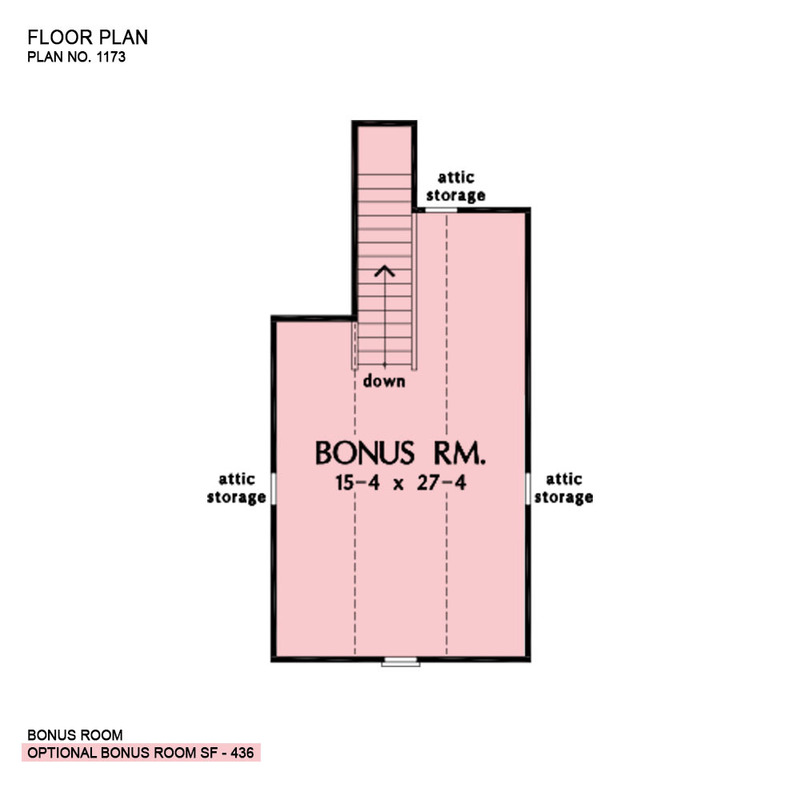 ft. bonus room is not included in the total square footage. 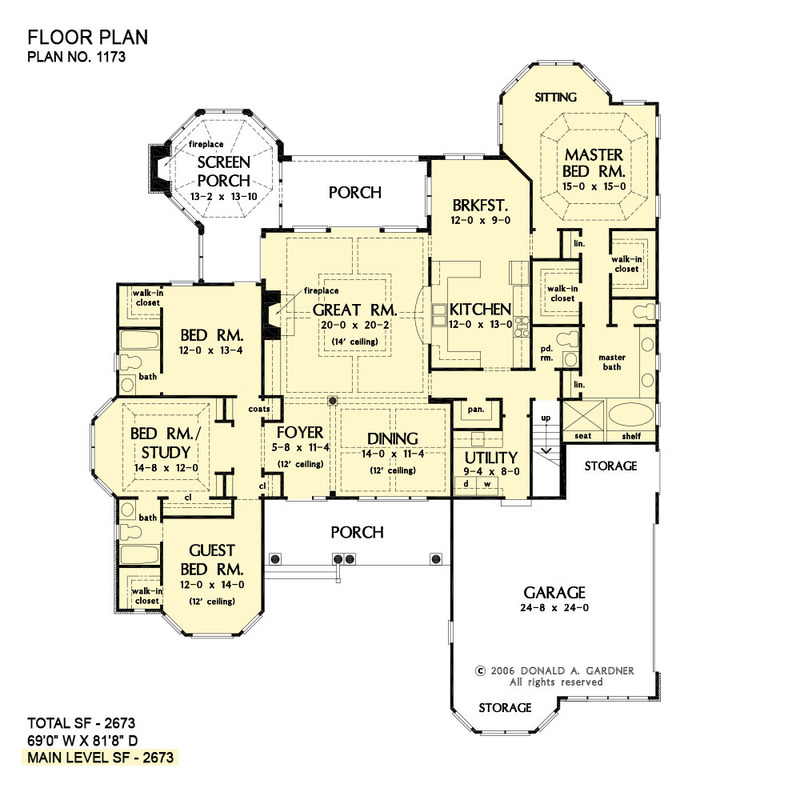 It would make a great hobby room or playroom for the kids in this house plan. Positioned for privacy, the master suite of this house plan is in a wing to itself. A spacious sitting area provides additional space, while his-and-her walk-in closets and vanities are an added luxury. 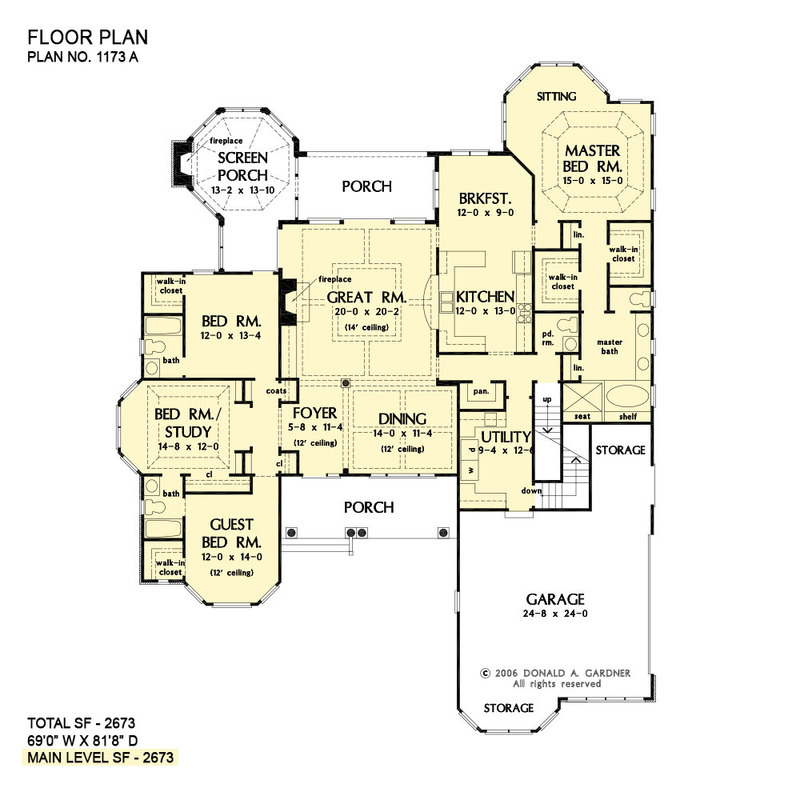 On the opposite side of the house plan are three secondary bedrooms. One has a bay window and the remaining two have walk-in closets. Two large storage areas in the garage are the ideal workshop or golf-cart space. 1st Floor: 2673 Sq. Ft.
House Dimensions: 69' 0" x 81' 8"
Great Room: 20' 0" x 20' 2"
Bedroom #2 : 12' 0" x 14' 0" x 12' 0"
Bedroom #4 : 12' 0" x 13' 4" x 9' 0"
Bedroom / Study (Tray): 14' 8" x 12' 0" x 10' 6"
Bonus Room : 15' 4" x 27' 4" x 8' 0"
Dining Room (Other): 14' 0" x 11' 4" x 12' 0"
Foyer : 5' 8" x 11' 4" x 12' 0"
Garage Storage Bay : 12' 8" x 4' 2" x 0' 0"
Great Room (Other): 20' 0" x 20' 2" x 14' 0"
Other : 11' 0" x 6' 8" x 0' 0"
Porch - Rear : 17' 8" x 8' 10" x 14' 0"
Porch - Front : 22' 8" x 8' 0" x 10' 4"
Porch - Screen : 13' 2" x 13' 10" x 9' 0"
Utility Room : 9' 4" x 8' 0" x 9' 0"